Image: “Contemplating Rebirth”, web collage by creative visionary Dana Hunt. We are a bit beyond contemplation, perhaps through that window, rushing toward the waterfall toward a new horizon. Can we be in both places at once? This New Moon suggests we can. This Aries New Moon is like a switch that turns on the light as it waxes toward fullness on the 19th. By then Mercury will finally be out of Pisces and join Chiron in Aries, followed immediately by Venus. The Sun moves into Taurus to join Uranus in that sign. We will feel the impact from beneath our toes to the tippy top of our heads. Meanwhile, things are becoming increasingly different. Is your world shifting in some irrevocable way? I asked this question on the last Full Moon. With Mars in restless Gemini and Mercury now moving forward, but still in Pisces, along with Venus and Neptune, we are certainly feeling it but not quite able, perhaps, to put a finger on just how. The Piscean brush stroke a little blurry, impressionistic or dreamlike—or anxiety-ridden. Yet, also with a strong, Venus-loving invitation to melt and merge (musical cue coming!) “Into the Mystic,” as Van Morrison sings. In relation to Neptune, I have oft repeated the shamanic motto, “The World is As We Dream It.” This is a good reminder now, let’s take it to heart. 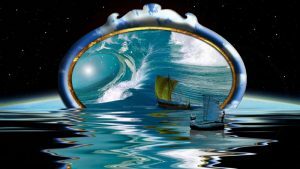 Waters are continuing to wash away under the cosmic bridge, even as Chiron and Uranus have both moved into their new signs, suggesting that we are over that bridge. Are some blinders dissolving? Are you perceiving things differently? How are you viewing the fresh horizons that are revealing themselves through newly sparked brain neurons, informed by Heart and Soul? This New Moon in mid-Aries invites us to jump on some kind of wild animal and take a ride. Which is your totem creature, your animal guide for this next seven years? I was introduced to Musk Ox, who brings “prosperity through perseverance and stability”. So Uranus in Taurus! I am taking this phrase in as I imaginatively climb on a strong Musk Ox back. I foresee a long steady ride, over some rough ground here and there, but I want to feel what I imagine to be a level of stability in steady movement forward, with meaningful pauses choreographed by any retrograde planets remaining this year. In fact, Jupiter turns retrogradein just a few days, on the 10th, zooming in on questions of belief, asking us to open our minds, expand our thinking. Are you able to entertain new possibilities? Most significantly, this New Moon at mid-Aries waxes under strong impact from a significant Capricorn challenge. A rigorous combo of Saturn, Pluto and the karmic South Node indicate a repatterning of global geometrics (shifting tectonic plates and magnetic poles) and various global systems (social, political, economic, weather). There has been A LOT of astrological attention on this power trio, that will create a large ripple effect throughout the next two-three years and onward. “There is a time for every purpose under Heaven,” as is written in the Bible. A profound “Plan” is unfolding in its time, NOW. Together, Master Elder Saturn and Death-and-Rebirth Pluto are riding the tail of the Dragon, in a rather prophetic season that is meant to be. [G-O-T Side Note— It really is the last season of Game of Thrones! As with the non-disclosure agreements securing secrecy about the final storyline of the popular series, it can be hard to see what is happening in the chaos of the larger world drama. Pluto is secretive and hard to fathom, as much is going on behind the scenes and under the surface. We are in a new season, if not the last season, as the collective landscape is heaving. Some endings are inevitable game-changers, as Pluto and Saturn continue their serious, necessary, and inevitable restructuring of our experience, influenced by cosmic waves coming into our system to wake us up— a Great Awakening. Another factor joins in this meeting of the powerful— the Centauress Chariklo is also present. Wife and teaching partner of Chiron, she has very special skills to offer. She takes whatever shape most serves love. Amidst this reshaping of our reality, I am so glad she is right in there on this potent transformational moment. “Here is one more turbo-charged combo that we ignore at our peril. The intensifying alignment of definitively Saturn with transformational Pluto and the Moon’s South Node in Capricorn is bringing stuff forward from our collective history—many levels of dark stuff, both individual and collective, that is absolutely necessary to acknowledge, bring into the light and purge. Old “stuff”—ancestral? historic? unforgiven?— attitudes, regrets, beliefs, self concepts, etc. )—can get in our way blocking growth and forward movement. In what ways do you feel like a root-bound plant in too small a pot? Now is the time to get laser-focused on your plan of action. It will reveal itself to you if you pay attention. Take your time to feel it out, and then go for it! The next Full Moon on April 19th and into the 20th is our green light moment.